This might be the world’s easiest cocktail recipe. It’s not a margarita, but it sure does remind me of one! It’s called a Salty Dog and it’s already one of 2016’s trendiest drinks. That’s not a scientific statement or really based on any fact… but all of my friends seem to be drinking them as it warms up here in Phoenix. How do you make one? It’s easy! It has 4 ingredients. In this version, I used Cascade Ice Pink Grapefruit because it has ZERO calories. That makes this a *skinny* drink! Normally, you’d shake your juice and vodka in a shaker… but Cascade Ice is a sparkling flavored water… so shake gently! 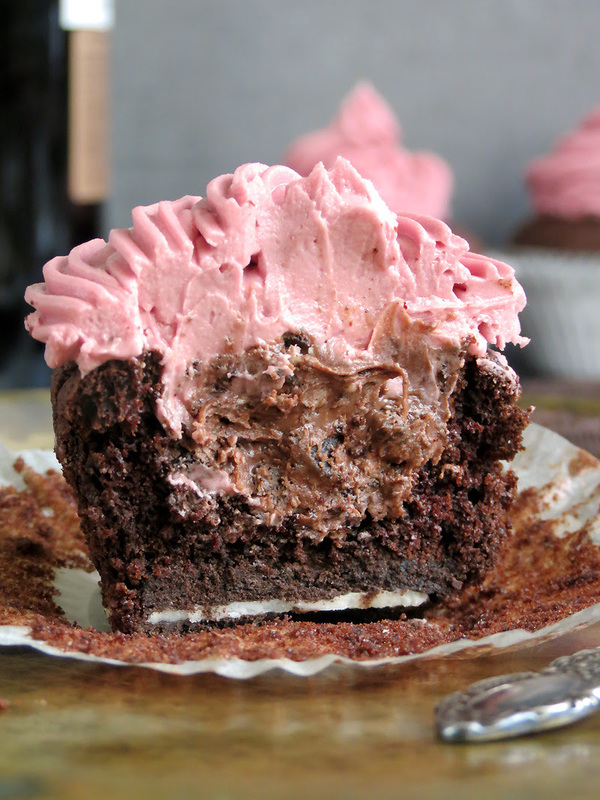 Oreo Nutella Wine Cupcake Recipe! No. Really. We have a recipe for Oreo Nutella Wine Cupcakes! This little gem came to us from Illumination PR and their client Nuvino. We tried to secure a sample of Nuvino, but one wasn’t available. We still think the recipe is pretty cool and would make for some good content… so here it is! This isn’t a paid endorsement or brand recommendation… so feel free to substitute with your favorite *red wine*! The cupcakes: In a medium bowl, sift together the flour, cocoa powder, baking soda, baking powder, salt, and cinnamon. In a large bowl, cream the butter and sugars together until fluffy. Add the egg and beat to combine. Scrape down the sides of the bowl as needed. Beat in the vanilla extract. Stir in Nutella and Nuvino’s Red Blend until evenly combined. Slowly add the flour mixture to the wet ingredients and mix until just combined. Place an Oreo cookie on the bottom of each cupcake liner. Pour batter over each Oreo cookie and fill each cupcake liner about ¾ of the way full. Bake the cupcakes for about 20 minutes or until a toothpick inserted in the center comes out clean. Remove from oven and place on a wire rack to cool completely. The filling: In a ziplock bag, place the Oreos and use a mallet to crush the cookies into small pieces. In a small bowl, combine Nutella with crushed Oreos. Set aside. The frosting: In a small saucepan, combine Nuvino’s Red Blend and sugar. Cook over medium heat, stirring, until sugar dissolves and wine comes to a boil. Reduce heat and simmer for 20 minutes (until the liquid is reduced to about ¼ cup or a light syrup texture). Let to cool. Assembling the cupcakes: Cut out the center of each cupcake with a sharp knife. Fill the cupcakes with Nutella & Oreo filling. Transfer the frosting to a piping bag fitted with a decorative tip. Pipe frosting into a swirl on each cupcake. Enjoy!